Get any chart from our website FREE by creating a Pinterest Board of all your favorite Joyful Expressions designs! How to Create a Pinterest Account (Profile) go to: https://www.pinterest.com/join/ and sign up. How to Create a Board: Go to https://www.pinterest.com/ and log in (if you had not auto saved your information). Click your name at the top of Pinterest. Click the Create a board box at the top of your list of boards. Name your board "Favorite Joyful Expressions" and choose DYI and Crafts for the Category for your board - you can also choose to make the board secret or invite others to join the board. Click Create Board when finished to create the board. Find your favorite designs on the Joyful Expressions website. When you are on a product page of a favorite design click on the Pinterest icon. Pinterest will display all of your boards, click on the board that you had named "Favorite Joyful Expressions" and "voila" you have made a Pin! When filling out the form there will be a request for that URL (address). Click in that message box and right click and click on paste. That's it! Another way to locate the address: Click on the three little dots at the top right, a drop down menu gives choices with one being "copy link." Enjoy making His Name Is Jesus.. I have made it for a few people now. So thankful for your site! I adore your site! It is amazing to find a place to order Biblical cross-stitch patterns. Please keep up the good work! Love your website and the Scripture Scarves are beautiful! I love many of your patterns. I have always enjoyed your site and love your Scripture Verse designs! Love your site! So many things to choose from. Your designs are beautiful. Thank you for sharing your talent with us! I am loving working on His Name is Jesus right now. I changed up the colors to a variegated plum/navy/dark teal silk with a plum silk, a navy silk and a dark plum DMC floss. Anxious to see how it turns out. Recently purchased COFFEE and am currently stitching it. Really enjoying it. I love your charts! Praise Jesus!! I got your free "His name is Jesus" and I so enjoyed making it. I gave it as a gift to my pastor's wife, and she placed it in the church prayer room to share with everyone. Thank you for making this available. I look forward to working more of your designs. I love your designs and hope to do quite a few! Love your designs. Keep them coming. May God bless. Would love to see pattern for fruits of the spirit in same format as His name is Jesus. Thank you very much for the pattern. May God continue to bless your talent. What a fun way to encourage us to explore your site! Love these charts, currently working on his name is Jesus and loving it. Love your site and designs. I absolutely LOVE LOVE LOVE your site!! I am looking forward to stitching my first Joyful expression cross stitch "His Name is Jesus". I am going to do the "His Name I Jesus" in varigated thread and all of the names around it in the colors of the variegated thread. So excited. I am so blessed to have come to know you and your wonderful work. I pray God will richly bless you and your family all your days my friend. I love you site!!!! Thank you so much for having it. Blessings! I stitched 1 Cor 13, 7-8 for a friend's brothers' wedding. I love your site. You designed a name verse for me ... Dawn ... and I gave it as a gift and she LOVED it!. I'm not working on His Name is Jesus in the blue tones. Thank you for this kind offer! I have done many of the His Name is Jesus and I just love it it never gets old! Thank you so much! I love your site! I wish I had time to do more stitching! Chart Choice: Heidelberg Catechism - Question 1. Love all your designs and your website. So excited to have a Joyful Expressions Pinterest Board. Thank you for offering this and for the free chart. God Bless! I have been a member of the Joyful Expressions Newsletter for many years. I live in South Africa. I was so blessed to blessed to have gotten some free charts in the beginning. Last year I went through many losses and needed healing. It was at this time that I took out "His Name is Jesus" and began stitching it in the pink shades as a gift to mom for mothers day. Little did I know just healing the stitching of this chart was going to be for me, with ever cross I stitched I praised God. This was a blessing to me. It's been a joy to discover your website & I love your designs! Thank you. Your patterns are awesome. Keep the designs coming!! Love them! this is so awesome! Thank you for the blessing of a free chart. I've had my eye on this for some time. This is a great promotion for a great web site - the only problem is deciding what to stitch first! I would like to have more patterns which illustrate the Bible verses as well as quote them. There are some really beautiful drawings people are doing in journaling Bibles. I think these would actually distract from the word but would make lovely cross stitch for a home. I have always loved all of your designs since I first found you with the Online Needlework Show. Keep coming up with new ideas. beautiful designs! Looking forward to more. God bless you richly as you share the gospel and allow others to store up His word in their hearts! I love your charts! I have begun two pieces, and look forward to seeing them on my walls! Thank you! I love how most of your charts look. It is great showing our faith with doing the works by hand. Displaying our faith in God and our thanks for Christ dying on the cross to save us from our sins. Thank you for joyfully expressing the faith. Love this site - thanks for all your designs! Thank you so much for all you do! I plan to stitch this for my wife. I love your charts! Thank you! Thank you, thank you, thank you! I really enjoyed doing "His Name is Jesus", so when I seen "Holy Spirit" I just had to do this one too. God Bless. I just Love your designs!! Was given the plan for His Name is Jesus and have been working on it. It is a beautiful design!!!!! I made the Names of Jesus cross stitch for my daughter in law in blacks, grass and yellow which turned out very nice! Chart Choice: Strength Dignity - Easy Frame 5 x 7"
Your designs are such an inspiration and got me wanting to stitch more. Studying Proverbs. looking forward to stitching this verse. Thank you so much! I am currently stitching the Names of Jesus piece and look forward to finishing it in time to use it to decorate the new home my husband and I are building. Was hard to choose between this and Jehovah or Holy Spirit, they are so special. I have a feeling I will be back frequently, lol. Do wish you offered an even weave choice in your kits though. Love your designs! I have done your His Name is Jesus and Isaiah 40:31 and want to do so many more. I want to do Jehovah and Hallelujah after the Holy Spirit. I saw the pic of "His Name is Jesus" years ago. I'm very pleased to have found the pattern. I love that there is one for each member of the Trinity! I also do a limited amount of calligraphy...and have a hunch that I could draw some of these faster than I can sew them! Is it also permissible to copy the pics of the cross-stitches featuring the names of God, free-hand, without purchase of the pattern? Thanks so much! I am not quite finished with your design in English as I was hampered by a bad hand and shoulder but I am thankful to you for the Spanish version as this is for my Commander in the Navy son who would love both. thanks a million. Nice job on your designs! can't wait to stitch this! Amazing Grace! This is my all time favorite hymn! I love your beautiful charts, thank you! Thank you for sharing! I really enjoy your newsletter and website. It has been great looking on your....Thanks for the opportunity. Keep up the creative designing! God bless you! 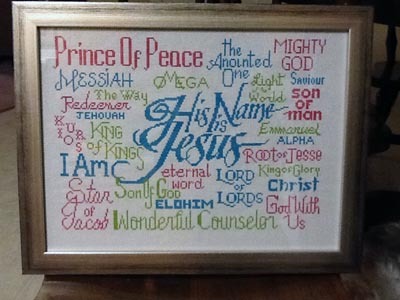 I love these cross stitch patterns with the names of Jesus, God, and the Holy Spirit. Thank you! I absolutely LOVE Joyful Expressions! There are so many charts I want to make and so little time! I stitched His Name is Jesus as a gift for my mother and LOVED how it turned out! I LOVE my coffee and I love the message this cross stitch chart proclaims. THANKS so much and I know I will be visiting Joyful Expressions on-line. Have a JOYFUL & Blessed week! This verse got me through my brother's funeral this past spring and if I have brain surgery in the next year I know This verse will be in my heart! I look forward to having it on my wall! Thank you. I'd been looking for the perfect verse to stitch for my mother's BFF Lucy who has recently been diagnosed with a fast growing cancer. My mom died 15 months after being diagnosed with a melanoma in her eye. Lucy has chosen treatment, whereas my mom did not. My mom died in January 2006, and, therefore, this verse is special to me. I hope it means a lot to Lucy, too. Chart Choice: C.O.F.F.E.E. Christ Offers Forgiveness for Everyone Everywhere"
Such beautiful work you have. I love your designs and I am very happy to have stumbled across your website. Scriptural affirmations are my lifesaver as I journey on my new path of widowhood. Thank you! Thank you for having these charts available for free and for sell! I love that I can combine both an activity I enjoy doing with some Bible verses. I have been looking for something like this. I think that the cross-stitch work you had and do is amazing. It is glorious to me to see how many people there are out there who believe. and are wanting to decorate their house or give as a gift to someone and share the joy and love that only He can give. I pray that you are able to continue doing your great creative cross-stitching. I have complete two of your His Name is Jesus pictures. haven't framed them up yet. One I gave as a Christmas Present a few years ago. I used a different hue of blue for each name. Thank you, again, for your wonderful works. Have a blessed day! Your designs are absolutely stunning !! Oh my goodness! There are so many beautiful ones it was hard to pick just one!! I LOVE the joyful expressions word designs !!! I have purchased a couple and would love to be able to collect them all, money permiting !! I love the multi-coloured Jehovah Cross Stitch Design. I also love the multi-coloured Holy Spirit Cross Stitch Design. Another I love is the ABC's 0f Faith Cross Stitch Sampler. I am overjoyed to find you! I have been stitching for years and have never seen your work. If it is possible I would like the Now I Lay Me which was labeled Childs Prayer as my free chart. Thank you again so much! I'm sure I will be shopping here again soon! I have been looking a long time for this particular verse in cross stitch. I found so much more! Woowoo!! Love these charts. Thanks for making such great products. I have stitched His Name in Jesus and will definitely stitch it again. It is just beautiful and I want to thank you for offering it. Thanks so much!!! Have A Wonderful Day!!!! Love your products. Doing lots of Christmas gifts. Your designs are beautiful and so inspiring! Thank you for the privilege of stitching such wonderful patterns. God bless! I have just finished Holy Spirit and pinned 'His Name is Jesus'. I'll send you a picture of the latest. Thanks for all these beautiful charts. Really like your designs and also your new needle minders. Look forward to ordering soon. I can't wait to do this! Your work is beautiful! God bless you for your designs and inspiration. I will be coming back to this site often. I love all of these. So hard to choose just one. I look forward to making this. I receive the newsletter from Nordic Needle. This is how I found you. Thanks. I love the designs that are on this site. Would love to try all of them. Your patterns are beautiful. I hope they inspire people to love one another. Sandra, you're great. Thank you and God Bless you. I refer friends to you when they are looking for Christian designs. I'm ready to start this project -- can't wait to get going on it. Thank you for nice designs! I love your designs. Thank you for your generosity. I love all the designs, wish I had more time to stitch them. I love your website!! This is wonderful that there is a cross stitch site with so many scriptures! What a wonderful ministry! God bless you! Thank you for the free chart. I downloaded the free names of Jesus chart. I will be making this for gifts for Christmas. I will be purchasing more charts in the days ahead. I just recently purchased the serenity prayer bookmark and will be making this for my sister for her birthday! Thank you again! What a wonderful site....I'm so glad I found it! I have recently been diagnosed with a rare type of sarcoma and this is one of those passages that I have to lean on! I really enjoy your site and look forward to stitching the patterns I have received from you! I love your designs - it was really hard to choose just one! I shall be doing some shopping over the coming months as I complete projects that I have on the go! Thank you! I will be ordering many patterns. Love your designs. So glad I found you. Your designs are just beautiful! I am planning on doing the names of my grandchildren, one by one! I love all of the patterns on this website! Free Design "His Name is Jesus"